During a one off show which progressive rockers Season’s End were performing with a symphony orchestra, bassist Mike Bridge struck upon the idea of making a truly symphonic-metal album, where the orchestra fully accompanies the whole metallic shebang. 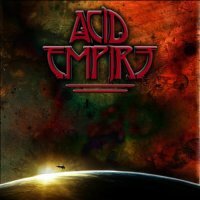 And so Acid Empire was born. Well they say the greatest ideas happen by accident and while the orchestra in question ended up being a virtual one, the results are really rather stunning. The album begins in understated fashion, allowing the synthesized strings and wind instruments to slowly build to a crescendo of guitars and drums, setting the scene for what truly proves to be a partnership of metal and classics. Unlike most of these sorts of albums, where a long established act has an orchestra reinterpret their songs into classical style, there’s no denying that ‘Acid Empire’ is an album that was fully intended to be this way. Banks of violins, brass and timpani constantly weave their way in and out of the brasher guitar themes, throbbing bass lines and stunning vocals. In fact other than the bass and acoustic guitar work from Bridge, the only other members of AE are guitarist David Stanton and vocalists Jack Lipinski and Hannah Bridge. The two singers combine to stunning effect across the album, although Hannah’s beautiful voice could be featured more prominently for my taste. Even with such impressive singers involved - not to mention that Threshold/Headspace frontman Damian Wilson gives a customarily assured performance on ‘Into The Void’, it is always the breadth of the symphonic/progressive music that unfolds beneath and sometimes above the voices that makes this an album of great scope and vision. Don’t expect a quick fix, in truth it took seven or eight spins of ‘Acid Empire’ before I clicked with it. However persevere and you really will be transported into an album that almost lives and breathes as you become as one with it. The themes range from brash and bold, to stark and intricate, however the songs flow seamlessly from acoustic guitar interludes with gentle violins, to full on rifferamas, galloping along on strident guitar work and swathes of strings. Nothing ever feels superfluous or overbearing, with the accusation that often accompanies albums that try to merge styles as ‘Acid Empire’ does, of genres being bolted onto each other, or fused unsympathetically, never even come close to that being an issue here. Lipinski sounds like a young John Wetton, with his tones having the power to cut through the different layers of instrumentation, whilst he also has the warmth to merge with the less bombastic sections, something Hannah adds to greatly, with her deep rich tones bringing to mind the likes of Annie Haslam (Renaissance), with her mixture of vulnerable restraint and mighty thrusting clout, proving irresistible. Choosing song highlights is a mighty task, as this is an album that moves from song to song via long preludes and reprises, constantly shifting shape, while referencing previous passages, leaving ‘Acid Empire’ as a mighty achievement from start to finish.